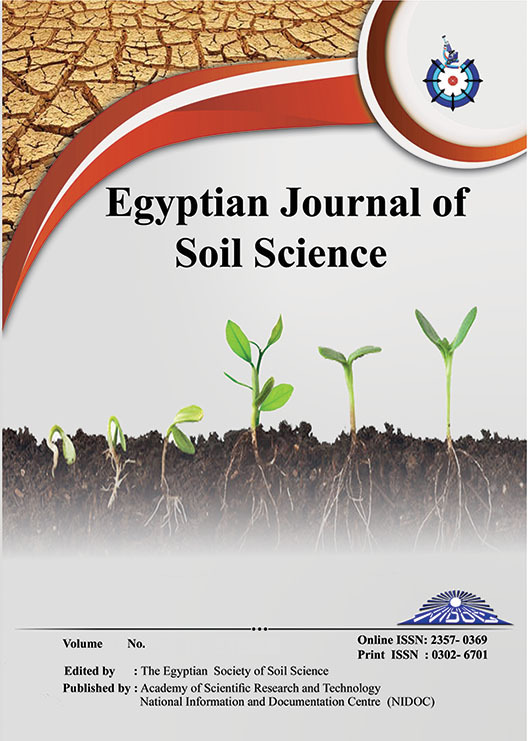 The purpose of this experiment is to elaborate the mode of distribution of both moisture and salt under drip irrigation system which is widely regarded as the most promising system in combination with saline water under conditions of El-Sheikh Zewied area-North Sinai (Lithic Torripsamments) during the summer growing season (March – June) 2015. It is just a trial to suggest a suitable irrigation management to increase production of a vegetable crop (Squash, (cucurbita pepo). Two methods of drip irrigation system were applied, i.e., surface and sub-surface with three quantities of irrigation water, i.e., 80, 100 and 120% of evapotranspiration calculated by meteorological equation of Penman-Montieth. Two emitter’s discharge rates, i.e., 2 and 4 liter/ hour were used to irrigate squash with saline water (4.5 dS/m). Split – split plot design statistically was applied. 1- There is a remarkable decrease in soil moisture content apart from drippers horizontally and vertically. 2- Irrigation water applied as a reference evapotranspiration calculated by penman-Montieth showed that water requirement followed the order increasing as 120 % < 100 %< 80 % under 4L/h dripper discharge rate. 3- Surface drip irrigation system cased more soil moisture content than subsurface one. 4- Dripper discharge rate 4L/h surpassed for soil moisture content which increased horizontally, while it increased vertically under 2L/h. 5- Salt concentration in soil increased apart from drippers by increasing irrigation water quantities and dripper discharge rates through growth periods. 6- Surface drip irrigation system help roots to be tolerable salt concentration by moving salts in the two up and down directions apart from roots. 7- Salt concentration significantly increased at 5% level growth season under surface and subsurface drip irrigation system as 90 < 60 < 30 < 1 days, respectively. 8- Biological yield decreased by using salt water under 2L/h dripper discharge and subsurface drip irrigation system, while the best water and salt distribution was conducted in the root zone under surface irrigation system and 100% of irrigation water applied. 9- The maximum squash yield , (significantly increase), was conducted to surface drip irrigation system by applying 100% quantity calculated by reference evapotranspiration approach as 7.59 and 7.4 ton/fed under 4 and 2 L/h dripper discharge rates, respectively. While the minimum yield, (4.4 ton/fed), was found by applying 80 % of water requirements under subsurface drip irrigation with 2L/h dripper discharge rate. 10-Water use efficiency significantly increased with 100% irrigation water requirements and 4L/h dripper discharge rate when applying surface drip irrigation system.